The WCPR Outstanding Performance Award (WOPA) is a scholarship set up by WAA to recognize WCPR active members who go above and beyond the call of duty. Candidates are submitted by the general body, vetted by the WCPR Executive Board and the WCPR Alumni Association officers, and submitted to the Office of Student Life for selection. Further details are available here (PDF format). Our goal is to reach $75K in the fund by by 07/01/2016. As of March 24, 2015, the fund contains $63,404.40 in cash and pledges We’re nearly there! $740 – 740AM Frequency Level – Named for the 740 AM broadcast frequency, one of several that WCPR used over the years, and its best-known. 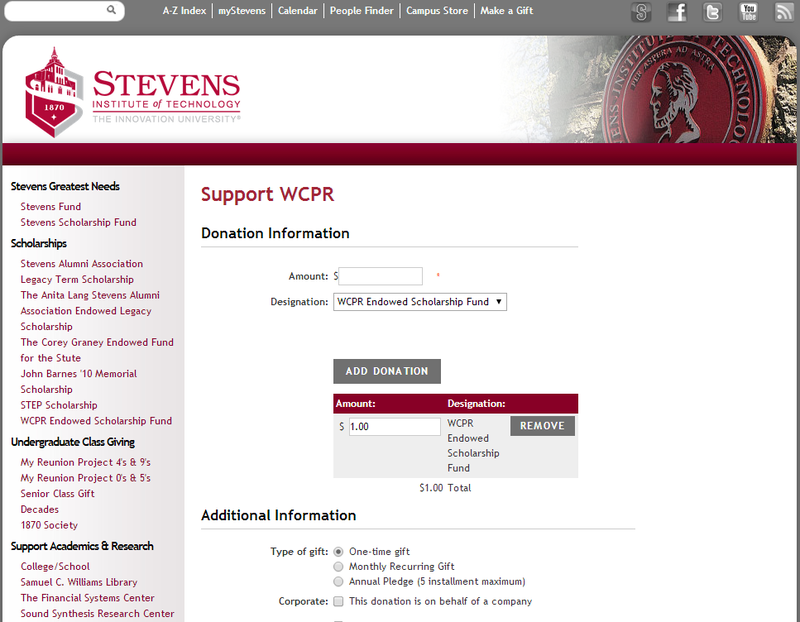 $1,959 – Founder’s Level – Named for the first year that WCPR’s predecessor (WSRN) was formed, which was 1959. Donations to WOPA are now easier than ever. 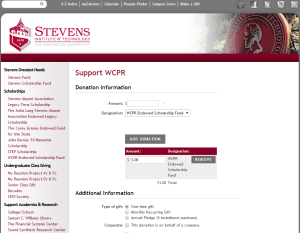 In your web browser, go to https://connect.stevens.edu/makeagift/wcpr. Enter the amount you wish to donate and click Add Donation, then fill out the payment details and click Donate Now at the bottom of the page. Questions about WOPA can be sent via email to scholarship[at]wcpralumni.org.